In 2017 the Egyptian government addressed many Jewish Heritage issues positively. While obstacles still remain and sensitivity on the issue still runs high, a new proactive preservation approach has emerged affecting synagogues, cemeteries and Torah scrolls. 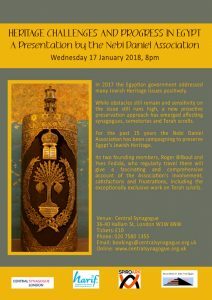 For the past 15 years the Nebi Daniel Association has been campaigning to preserve Egypt’s Jewish Heritage.